ART Hardwood Flooring Ltd. Design, installation and finishing of quality hardwood floors. Welcome to ART Hardwood Flooring. We specialise in designing, installing and finishing handcrafted quality hardwood floors. ART was founded over 20 years ago working on the philosophy that quality is the key when it comes to both service and craftsmanship. We are very proud of the reputation we have built up over the years in both the domestic and commercial markets. Our own highly skilled team combine traditional craftsmanship, modern equipment and the latest technology. A quality control system during the installation and finishing process results in a consistently high class product. Professional customer service, quality workmanship, cleanliness and competitive pricing for the high standard of work we do. Wooden floors are environmentally friendly and we use the finest material from sustainable sources only. A variety of timbers: ash, beech, maple, oak, mahogany, jatoba, ebony, ipe, doussie, cherry, merbau, afromosia, walnut and wenge are just a few of the hardwoods we use in our floors and borders. A wood floor is an investment, increases in value, and brings a distinctive feel of class and elegance. It is durable, hardwearing and easy to maintain, creating a clean and healthy environment. No other asset benefits an interior like a hardwood floor. We design the hardwood floor to suit your individual needs. Installing and finishing all types of wooden floors including mosaic, woodblock, strip, plank, boards, parquet and custom-made parquet panel floors with decorative borders. Traditional patterns as Herringbone and Basket, French Chevron known as Hungarian Point, Versailles, Monticello, Toulouse, Regency and Castle design panels. 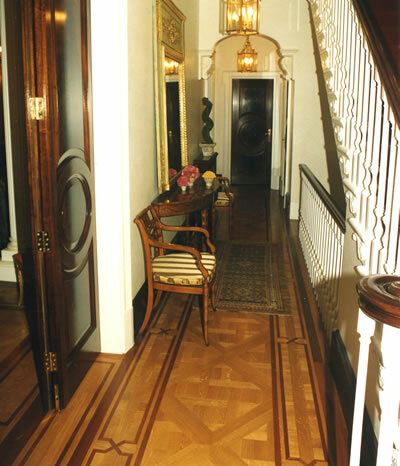 Antique hardwood floors and antique floor finishes. Reclaimed hardwood floors and floors made from reclaimed material. Sports floors and dance studios with non-slip finishes. Supplying and laying all types of solid pre-finished and engineered floors from leading manufacturers like Junkers, Kahrs, Karelia, Lonsdale, Lauzon and many others. We lay hardwood floors, according to British Standard 8201, on all types of sub-floors including underfloor central heating systems. A comprehensive range of hardwood floors for the commercial market. Sports halls, dance studios, sound and vision recording studios, museums, art galleries, churches, offices, boardrooms conference centres, schools and dining halls are all offered advice as necessary, from our experienced team members on the choice of species and finish to suit their purpose. A restoration service to all wooden floors. Refurbishing, renovating, repairing, sanding and finishing floorboards, traditional old parquet floors and contemporary wooden floors. We manage insurance claims, providing a complete service. For the perfect floor finish we use polyurethane, oil and water-based seals, hot wax, oil and hardwax-oil. The best interiors always start from the ground upwards. Please visit our Showroom: the design possibilities are endless. 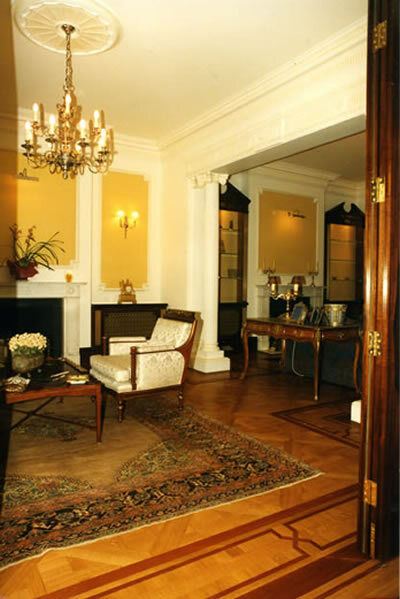 We will help you to find the ideal floor designed to your individual requirements.